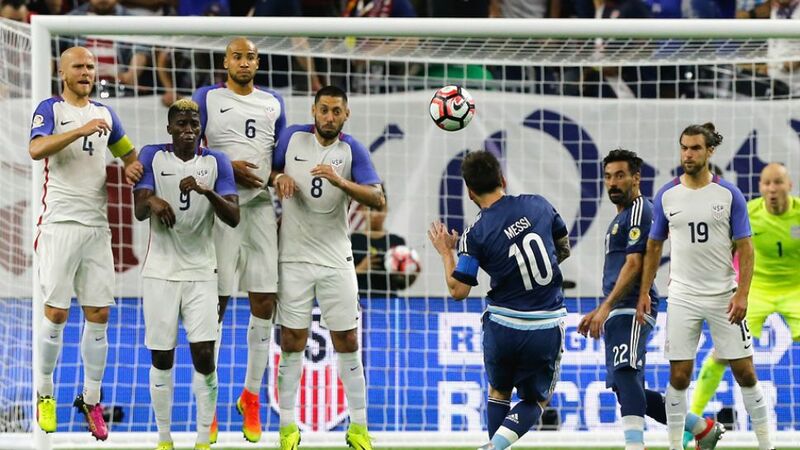 The USA's hopes of winning the Copa America Centenario on home soil were clinically crushed by Argentina in the semi-final, as Lionel Messi orchestrated a 4-0 win for the South Americans. Jürgen Klinsmann's side were without new Hamburger SV striker Bobby Wood and former FC Schalke 04 midfielder Jermaine Jones through suspension for this match, and were overrun by fierce Argentina pressure from the very start. Messi's delightful chipped pass over the defence set up Ezequiel Lavezzi for the opener after just three minutes, before Messi added to the scoreline himself with an outstanding direct free-kick. Borussia Dortmund starlet Christian Pulisic was introduced at half-time to give the USMNT greater creativity in the final third and he caught the eye with a couple of bold runs down the left. However, once Gonzalo Higuian added a third for Argentina the outcome of the game was never in doubt, and the striker's late second capped a dominant display for La Albiceleste, who progress to Sunday's final.